For nearly 50 years, the Shoreline Riders of Fort Bragg, California have hosted an annual rodeo. In my 21 years of living here, I’m ashamed to say I’ve never attended. In fact, I’d never been to any rodeo until last Sunday when I strong-armed my friend Marcia and her eight-year old granddaughter Mackenzie into letting me tag along. Disclaimer: Far be it from me to judge anyone who expends the energy to put together a petting zoo. If I hosted one, it would be located inside the plastic hoop house that covers my raised vegetable beds. The humidity that drips off the ceiling creates a mini-rain forest environment which would add an educational component to the experience. One deaf 14.75-year old black dog with a three-pound fatty tumor on his right side. A belligerent 9-year old gray cat. 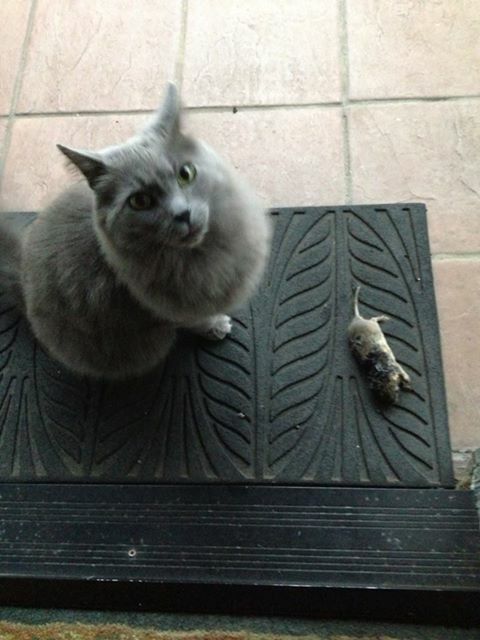 Whatever half-eaten furry rodents the cat could supply. I would not charge an entrance fee, but for fifty cents you could view the tattoo on the inside of my left ankle. For a dollar more, I’d take you on a tour of The Purity Market. The aforementioned super cute piglets. A small raggedy sheep that was lying down, avoided eye contact and gave off the aura that it could never be coaxed to stand. Two pigmy goats that had the psycho look of extreme post-traumatic stress disorder and tried to make themselves invisible by hunkering down behind a bale of hay. A large predatory-looking rooster that no child wanted to touch. A denim-clad, cowboy-booted elderly rancher. After a few minutes, it was time to head to the stands and take in my first rodeo. I asked the rancher where to leave the piglet. “Just put it in the bucket.” He pointed to a five-gallon recycled paint bucket that held a few handfuls of hay. Really? Put the piglet in that bucket? Really?!? How about I put it in my purse and take it to the SPCA? I was there to enjoy my first rodeo—not to bring the law down on the poor petting zoo rancher. The piglet went into the bucket where it stayed for about 10 seconds before another child scooped it up. I urged Mackenzie out of the area and into the stands. The petting zoo left me emotionally scarred. Fortunately the bulk of my life is behind me, so I only have to suffer this particular trauma for the next two or three decades. The rodeo, on the other hand, was filled with excitement: bucking bulls attempting to crush their riders, women expertly steering their horses in arcs around barrels, cowboys flying through the air and landing hard to tie down calves, and the horses—the beautiful horses that were so impeccably partnered with their riders. Not having been to a rodeo before, I didn’t know how to behave. I loudly oohed and awed, shrieked and cheered. The woman sitting on my left was rather stoic and drank a lot of beer. I hope it was because she was enjoying her afternoon—or that she was an alcoholic. I hope it wasn’t to dull the pain of sitting next to me. I highly recommend the Shoreline Riders Rodeo. I’m definitely going next year. 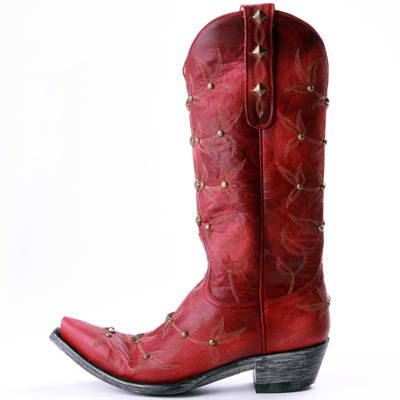 In the meantime, I just might buy me a cowgirl hat and pair of boots. Yes, Jessica—a pair of red boots. 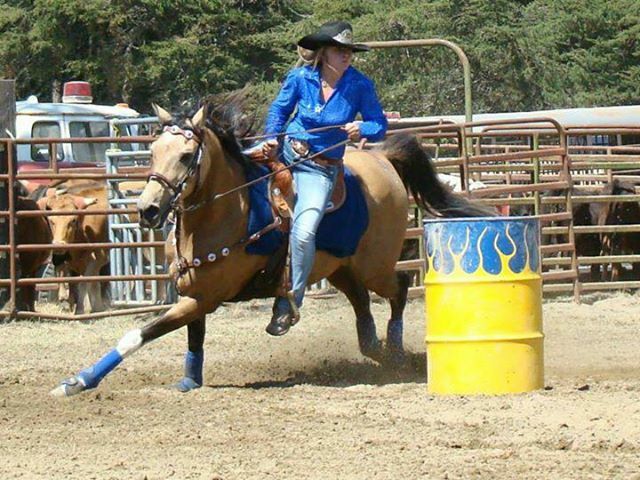 This entry was posted in Fort Bragg California, Humor, Mendocino County, Small Town and tagged Mendocino County, Shoreline Riders Rodeo by Kate. Bookmark the permalink. Delightful news of the rodeo in Fort Bragg! Yeee-Haww! We’ll certainly organize our posse to get you on down to the ol’ HAV store when you come to the Wild Wild NorthWest…..fixin’ to find you some red boots and the perfect Stetson. Looking forward to it! Another winner, Miss Kate! Loved it! I’m thinking that YOUR petting zoo might be a wonderful ‘new’ attraction for Paul Bunyan Days–and it’s free! Something to do after the Kiddie Parade and before the Water Fight!! Great idea, Marcia! Maybe I can even pick up a couple of bucks with my tattoo and Purity tours. Every time I read your writing I go away with a smile on my face and a phrase I hold onto and turn over in my mind like the smooth stone I carry in my pocket. This time the pairing of words was: “impeccable partnering”. Having competed in rodeos as the heeler of a team roping duo, I know exactly how that partnering with the horse feels and when it is impeccable it is the closest a human will ever come to knowing how it feels to be a centaur. Thank you, Kate, for the laughter and the treasures your stories bring. I thought of you, Heidi, when I was at the rodeo. I gained a whole new level of respect for you and your equestrian abilities. 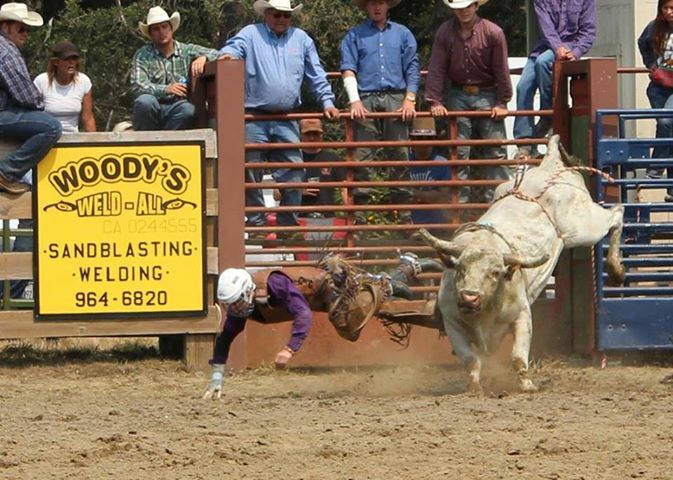 I had no idea the training and strength that goes into being a rodeo competitor. I’m in awe.